It's already time to start thinking about Christmas shopping and a fantastic new Chuggington DVD called Chuggington Chug Patrol: Ready to Rescue was just released on August 20th, the PERFECT gift for your train loving little ones! This brightly colored, animated adventure DVD is just perfect for all of the junior engineers around! Chuggington Chug Patrol: Ready to Rescue follows our three favorite trainee engines and introduces a new character. The Chuggington series helps the trainees learn important lessons like teamwork, perseverance and trying their best, and respecting one another. Each episode are social stories that are designed to teach simple and important, social-emotional lessons that help preschoolers prepare for their early learning years. "In Control and Ready to Roll!" "Wilson, Koko and Brewster are moving up to the next level of training! In Chug Patrol: Ready to Rescue, the first ever, super-sized special, Wilson takes on new challenges and makes daring rescues as the newest member of Chuggington's emergency rescue squad. There's six fantastic episodes on this all-new film! Koko and Brewster join in on the new adventures as do new characters Chug Patrol Chief Jackman and super-speedy Hanzo! In 4 other traintastic episodes, the trainees compete to be part of Skylar's Rescue Squad, undergo crane training, and help Piper learn a valuable safety lesson. Get those wheels to the rails for all new adventures in Chuggington!" I rarely let my daughter watch any television. Until now, she has watched Sesame Street and that's it. However, I have fallen in love Chuggington and this is one movie that I have absolutely no problem letting her watch! Social stories are great teaching tools to help toddlers and preschoolers learn about the world around them. Chuggington: Ready to Rescue is an affordable movie, for sale on amazon for around $10 and is THE perfect for a stocking stuffer this holiday season for your preschool aged little one. There's even a Chuggington iPod/iPad APP! You can catch new Chuggington episodes on Disney Junior, play free Chugginton games, and even download Chuggington printable coloring pages, mazes, dot-to-dots, hidden pictures, and cutting activities! Let me just tell you, activities like these are FANTASTIC to get your child excited about participating in fine motor activities and refining their fine motor and visual-motor skills. There’s more cool news, too! In celebration of the new release of Chug Patrol: Ready to Rescue, Anchor Bay Entertainment has teamed-up with My Gym, the leading fitness center destination for children with hundreds of locations across the U.S.! Have you heard about MyGym? My Gym has developed an extraordinary program and facility devised to help children 6 weeks thru 13 years of age develop physically, cognitively and emotionally. They offer structured, age-appropriate, weekly classes that incorporate music, dance, relays, games, special rides, gymnastics, sports and more. Children have loads of fun as they gain strength, balance, coordination, agility and flexibility while developing social skills, confidence and self-esteem. Our state-of-the-art facilities, extensively trained staff, award-winning class programs, and excellent student/teacher ratio have earned My Gym the reputation as the best early learning program of its kind. My Gym is dedicated to reversing childhood obesity. Our facilities, programs and services empower youngsters by helping them acquire the skills, confidence and positive self-image needed to become healthy young adults. We are committed to nurturing children, treating them with understanding and positive reinforcement, maintaining a supportive and noncompetitive atmosphere, and making learning fun and exciting. So guess what?! 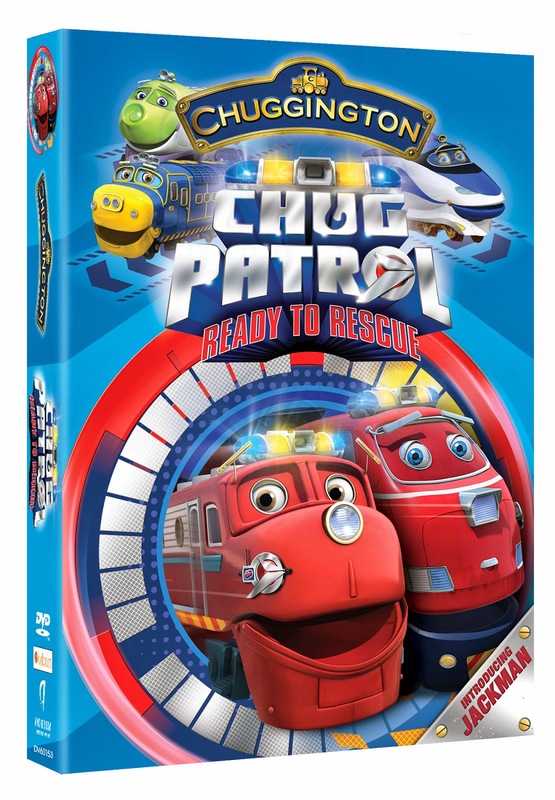 The amazing folks from Chuggington are providing a fantastic giveaway to include the Chug Patrol: Ready to Rescue movie as well as a special certificate for one free MyGym class and $20 off a Lifetime Membership! Chances of winning are dependent on entries received. I would be giving this to my grandsons! I would give it to my sister for my nephew. I would definitely watch this with him! My son isaac hes a big fan!! I would give this to my son; he's a big fan. my son, he would love this!! I would give this to my sweet grandson who just turned 2 this month! Thanks!! This would be a joint Christmas gift for my 6 year old son and my 2 year old daughter. They would both enjoy this. Thanks! I would be giving this to my son! Thanks so much for the fantastic giveaway! This would be for my traintastic two year old! I'd give it to my nephews. My boys love Chuggington and would really enjoy this!! my 2.5 year old daughter LOVES Chuggington! So this would go to her! My 3 year old daughter, she loves Chuggington. I would give this to my five year old son. If I won, I would give it to my nepwhew Kayden! would give it to my nephew. I'd give this to my little nephew! My daughter, she really likes Chuggington - and I think it's super cute too.